From homegrown hops to creative additions like strawberries, apples and sweet potatoes, the craft brewers of Ontario’s Southwest are thinking out-of-the-bottle to create some truly unique flavours in their brews.What follows is blogger, Lisa Jackson&apos;s account of her experience tasting and touring at some of the region&apos;s trailblazers. The jig is up! Although Ontario’s Southwest has flown under the radar for awhile, this region is becoming uber popular for foodies seeking a gastronomic retreat. After a weekend in Norfolk County, I’m sharing four of the best kept (and delicious!) secrets about the food scene in Ontario’s Southwest. But go quickly: once the hipsters find out, tourists will flood this region. From homegrown hops to fruity flavours, Ontario’s Southwest is rapidly gaining a name for its craft beer scene. 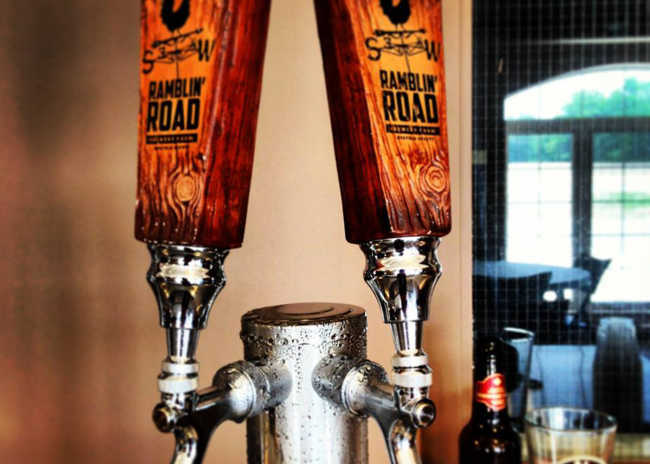 Microbreweries are thinking out of the bottle and brewing with local crops, creating some unique craft beers – like Ramblin’ Road’s potato beer. Raised on a corn farm, Picard opened the first brewery farm in the region. Now, beer lovers flock here to traipse through his hops fields and try brews like the Dakota Pearl Potato Ale. For this recipe, Dakota Pearl potatoes are sliced and washed in the pre-brew. Then, a secondary mash is prepped and blended to create the potato laden beer. Such a blend yields an incredibly light and smooth ale with earthy tones and a sweet aftertaste – ideal as a summer drink or for pairing with mussels, chicken, and salmon. The Blue Elephant Brew House & Pub has also created a Strawberry Lager that’s been a smash hit; but it’s only one of many concoctions from this tiny micro-brewery. The microbreweries of Ontario’s Southwest are humble, but mighty: brewing seasonal recipes, supplying beer in reusable growlers, and shrugging at expansion into the LCBO. Such a move would, after all, contradict the concept of a microbrewery. Like bread, craft beer is meant to be brewed in small batches and consumed within a day or two. So if you want to try these unique craft beers, your best bet is to visit Ontario’s Southwest and order a pint. While only two months old, this program is already generating a buzz among beer connoisseurs. Once a month, two beer lovers cram into the Blue Elephant’s tiny brewery with brewmaster James Grant. Together, they create their own speciality craft brew, which is eventually put on tap and sold to customers. The workshop costs $200 and starts two weeks earlier, during a one-on-one with Grant to discuss the vision. 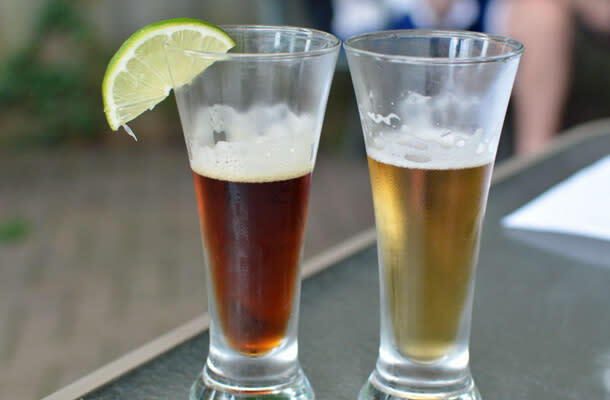 What type of beer: a lager, ale, porter, or a flavour-infused product? Are any local ingredients to be used, such as Riesling grape skins, sweet potato, apples, strawberries, sour cherries? What’s the name of the brew? Afterwards, Grant starts to develop the recipe. He tells me to watch my step, as a stream of beer flows under my feet, within a hollow, open pipeline. The last thing I want to do is contaminate the masterpiece, so I step away. Part of brew camp also involves learning the terminology and the science behind ale-making. By the end, you can brag about being a Badass Brewmaker – with the recipe to prove it. In Ontario’s Southwest, chefs and food providers embrace “farm to fork” philosophies, creating dishes from fresh fare growing in the surrounding farm fields. Farm to fork is the crux of his restaurant, The Combine. After a stint in Banff, Rivard returned to his hometown, seeking a new venue to serve “honest, authentic food.” The Combine opened two years later, in a heritage home in Simcoe. The menu is influenced by local farm fare, as well as Rivard’s childhood memories in Simcoe (“I make an all-beef corn dog, inspired by the Simcoe Fair”). Most dishes use ingredients freshly picked from the eatery’s onsite garden. I munch on a leaf, savouring the vinegary aftertaste. Tonight’s wood-fired oven pizzas will feature this tangy plant. Meanwhile, Chef Rivard points out other plants and herbs – pattypan squash, zucchini, arugula, basil – and talks affectionately about each one. The smorgasbord continues at nearby Jensen’s Cheese, a third-generation fromagerie that makes delectable artisan cheddars. Down the street, the Blue Elephant Craft Brew House & Pub sprinkles Jensen’s mozzarella on their pizzas – legendary for their dough baked from the leftover grains used to brew beer. But wherever you go in Norfolk County, it’s a feast of farm fresh fare. 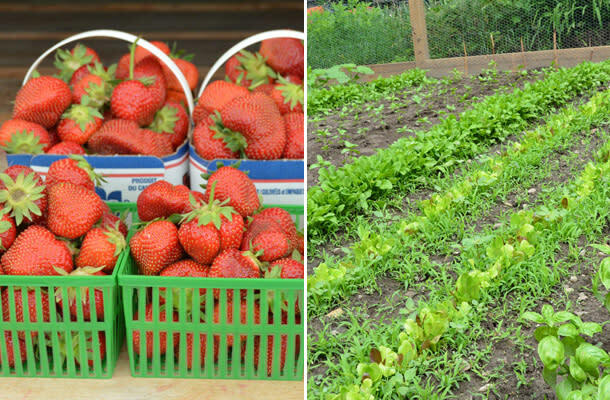 Ontario’s Southwest is one of the best places in Ontario to grow strawberries, yielding endless roadside stands where you can buy a basket (or two) of berries. The strawberry also plays a starring role on Norfolk’s menus, and even makes its way into a Strawberry Lager at Blue Elephant Brew House. If you’re hiking or biking the Lynn Valley Trail, get off the path at Decou Road and walk five minutes down the road to Meadow Lynn Farms. This farm grows twelve different varieties of strawberry and you can stop for a snack or even pick your own bucket o’ berries. For something really special, stay for “Walk the Crop” – a guided tour through the patch, learning about berry-growing and cooking with strawberries, followed by a berry tasting. At Ramblin’ Road Brewery Farm, the tasting counter is free for visitors, and a small snack bar will soon be open upstairs. Every Friday and Saturday night, The Combine offers a Chef’s Table with a prix fixe menu ($120 with wine pairings; $80 without). Reservations are essential. Register for the Blue Elephant’s Brew Camp. For an active adventure, bike or hike the Lynn Valley Trail – an 11km old rail line turned trail that starts in Port Dover and ends in Simcoe. Bring ice cream or pint money! For accommodations, book one of the two rooms at Culverdene House – a lovely Victorian home converted into a cushy B&B serving a hearty breakfast and surrounded by 200-year old trees. Lisa Jackson is a freelance journalist and the editor of Eat Drink Travel Magazine. She has visited over 25 countries and specializes in writing about history & culture, food & drink, outdoor adventure, and conscious travel. Follow Lisa on her foodie adventures around the world at eatdrinktravel.com.